Ok, not too bad, it's only been 8 days since the last post. If I can keep it at least one a week, I'll be happy. 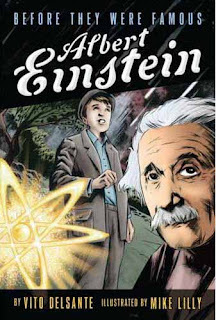 I'm currently working with Mike Lilly on a Graphic Novel for Simon & Shuster, "Before They Were Famous; Albert Einstein". I'm lending my Inking skills over Mike's great looking pencils on a decent amount of pages as Graphic Novels, as you know, have a high page count. You can read more about it in this Newsarama Interview with Mike. Also on the comic front, I've hooked up with Bruce Sakow on a small comic endeavour. Bruce, no stranger to comics, wrote for books like G.I. Joe, Wolverine, and Conan and has also written a bunch of screenplays including "Friday the Thirteenth: The Final Chapter". We're currently adapting one of his screenplays into Graphic Novel form and some of the preliminary work has already been done. You can check out some of the Prelim pages for "The Seer" here. I thought I would build on the Introduction some more and make some links available to check out something a little more visual. My Myspace Page. Thats pretty self explanitory. But it does have some older Bloggin type stuff on it if anyone was interested in checking out some of that. And one of the cooler websites, ComicSpace. Here I have a bunch of Galleries displaying tons of Comic pages and Sketch cards and a few other things as well. It's an interesting resource for aspiring and established comic artists. Yes, a brief introduction sounds like a good place to start. For those that don't know me yet, I'm a Freelance Artist and work in the Comic Book, Sci-Fi, Trading Card, and Entertainment Business. (busy-ness) I work out of my Studio here in Connecticut and, like most Artists, can never find enough time to do everything that I'd like to do. So, like a turd head, I've started a Blog to add to that list of things that eat up all my time. Now I tend to ramble on when I attempt to type out all thats swirling in my skull, but I will try to keep everything as simple and to the point as I can. (Like that sentence you just read... I rambled on with that one for awhile before chopping the hell out of it into it's current state.) wait, I think I just rambled again, see what I mean? So for any that have just read these words, welcome. Hope I can keep it interesting for ya.